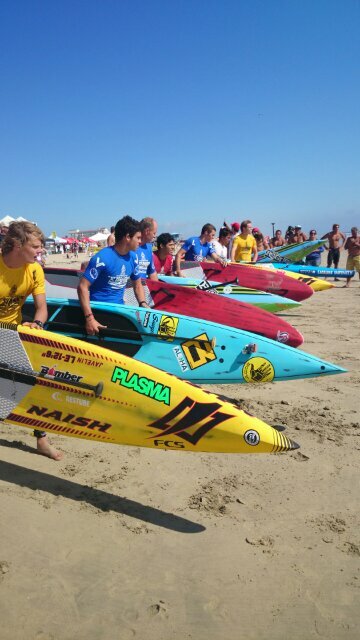 We’ve just wrapped up the Huntington Beach Pro, where many of the world’s best paddlers battled it out in the penultimate leg of the 2013 Stand Up World Series. Yesterday (Saturday) saw the knockout sprints while today (Sunday) it was the distance race. 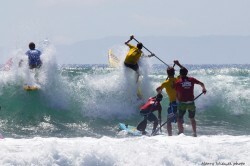 After perhaps the most stacked field in World Series history provided plenty of entertainment in the punchy waves, the men’s side of the draw was whittled down to a final 8. With a dropping tide and increasing wind making conditions trickier and trickier for paddlers (but more and more entertaining for the fans) the final could have gone to anyone. But eventually it was overall Series ratings number #2 Kai Lenny who prevailed to claim day one, while 15-year-old Ke’ale Dorries from Australia surprised everyone (except the Aussies) to take out the women’s event and be the first girl other than Annabel (who was absent today) to claim a World Series win this year. 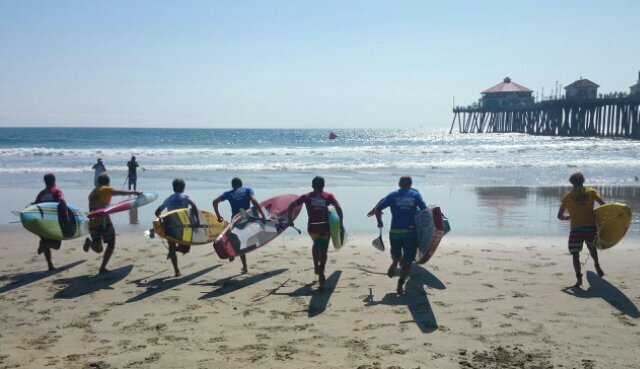 Day two, which has just wrapped, was also greeted with decent surf that made the start of the Distance Race an interesting affair. Despite a set rolling through right after the horn blew, somehow the favourites found their way to the front and controlled most of the race. Series leader Connor Baxter and his main rival Kai Lenny were going back-and-forth in the lead for much of the 10km course, but on the final leg everything was up in the air and suddenly the guys battling for the minor positiosn found themselves near the front. Casper Steinfath and Kody Kerbox both made great moves from further back in the field up into contention, while Jake Jensen from Australia was probably the closest other paddler to Kai and Connor for the entire race. With the wind increasing and bumps coming into play, the lead switched several times in the final kilometre. As paddlers came in for the final buoy turn among the waves it was still anyone’s race, but a great move by Jake saw him take a solid lead out to the final outside buoy. The Aussie rounded the outside buoy, charged back into the beach as his rivals battled for second and stayed on his feet to surf a set wave in and take a memorable win. Coming home second was Kai Lenny, with Kody Kerbox, who seemed out of the race earlier on, coming home for a fine third position. Casper Steinfath added a 4th place to his 3rd from yesterday, which should see him take third overall for the event. Mo Freitas filled out the top five while Connor Baxter, unlucky considering he led for much of the race, came home sixth. Overall Kai Lenny clearly won the event, with a first and a second putting him ahead of Jake Jensen (4th and 1st) and Casper Steinfath (3rd and 4th) for the overall Huntington Beach Pro title.